The Marshall Plan has been widely regarded as a realistic yet generous policy, and a wise construction of the national interest. But how was the blend of interest and generosity in the minds of its initiators transformed in the process of bureaucratic administration? 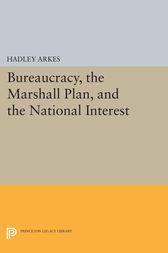 Hadley Arkes studies the Marshall Plan as an example of the process by which a national interest in foreign policy is defined and implemented. The author's analysis of the efforts to design the Economic Cooperation Agency demonstrates how the definition of the national interest is fundamentally linked to the character of the political regime. His account of the discussions in the executive branch of the government, the bureaucratic infighting, and the deliberations in Congressional hearings and floor debates also shows how, in the process of making decisions on administration and procedure, the bureaucracy itself affected the aims of the Plan.